Samsung is having a pretty bad time of it right now. Having announced that a recall of all Galaxy Note 7 smartphones was required after some were reported as catching fire whilst on charge, Samsung may have been forgiven for thinking that it had gotten out ahead of the problem no matter how embarrassing it may be. And it was probably right, but the problem it now faces is that these phones are still exploding, with the latest being the first reported case of a Galaxy Note 7 combusting in Australia. 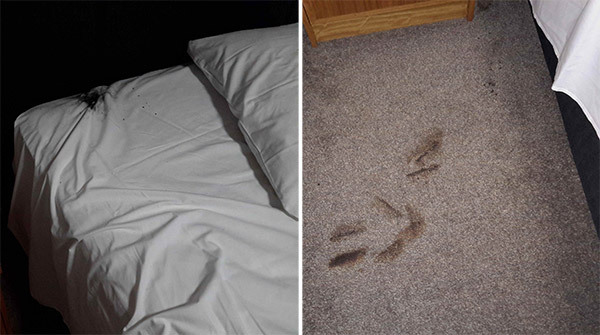 As if the smartphone catching fire wasn’t a bad enough headline, though, this one managed to cause over $1300 worth of damage to a hotel room in the process. A bad day at the office for Samsung’s P.R. rep incoming. The phone in question belongs to Tham Hua, who took to Reddit to complain of his Galaxy Note 7 catching fire whilst he lay, asleep, in his hotel room. Upon being woken by what he describes as a small explosion, he understandably knocked the device off the table and onto the floor. Unfortunately, being on fire, the phone caused a spot of damage to its surroundings – damage to the tune of $1380. As for the phone itself, it’s in a bad way. 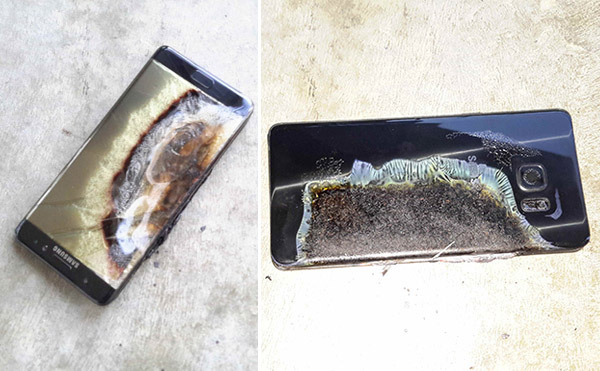 Photos of the device show it pretty well charred on both the front and back sides and Hua says the thing is in such a state that he can’t even open the SIM tray in order to retrieve the SIM or the microSD card he was using with the phone. If the photos don’t do it justice, that right there should tell you the state this Galaxy Note 7 ended up in. The good news in this story is that Samsung has given Hua a loaner phone – we don’t know what phone, before anyone asks – and will pay for the damage to the hotel room, which is great. I contacted Samsung and they told me to wait but if the phone got hot to stop using it…LOL. Then what would I do? Tim Cook is probably reading about this with wry smile on his face. How many firetrucks did it take to put out that massive fire? Those burn marks will buff right out. Clearly hates samsung. That, and he has no regard for other people’s safety. Disgrace. I am waiting for the first Note 7 user exploding his face while charging and using the phone/using headphones. Still NO OFFICIAL world recall. Why fall asleep when you’ve been told there is an issue??? Any old dodgey batrery can explode if overcharged &you leave a phone that’s had some problems & a recall notice about fires sitting on a fast wired charger while you sleep?? Samsung could aost say that they warned you & its your fault yet they still came to the party. I think user played a big part in this 1. I never leave phones on charge thewjole night as the way chargers get mixed up you never know if you can trust them & the phone to switch down voltage or turn off when its full. I use my fast wireless &my note 7 has never gotten as hot as my note 5or 4did running heavy tasks. I wonder if others have found this too? I’ll watch my note 7 carefully now on charge till I can swap it for a new one. I’ll be going back for more as you vcamt beat the note & the 7 is best by far. Living large! But this is a spanking new phone that has not even been released for more than a month. That’s acceptable if it’s some budget cheapo phone from some Chinese brand. But no, this is a friggin expensive, $900 phone. Everyone would expect it to work flawlessly. Also thus far, all cases of phones blowing up are caused by unauthorised chargers, but this is not the case for the Note 7. Why are people still leaving it plugged in overnight near bedding and carpet? Stupidity knows no bound. There is a recall notice on every carriers website and samsung refuses to sell them anymore. That’s as “official” of a recall you can get. Don’t let our countries government (assuming your from the u.s.) fool you. Because if you do not you get woken up with 70% of juice left (if it was 100 in the evening). And with phones that consume freakin lot of battery that would just last till lunch and not until after the work when you can charge it again. Some people use phones for business and can not take the risk of running out of the power because it discharged during the night. Manufacturers should make it safe to leave it like this since it is a normal procedure for charging. This guy has a smartphone with presumably internet access, and hasn’t seen the hundreds of articles all over the Internet about the Note 7 recall and its issues? Still sells in Europe! Just got a commercial from a big electronic chain store with Samsung note 7 on front page saying: Available now. That was today. It’s been recalled anyway, the question is why would you continue to use/charge it without paying attention. Samsung admits there is a problem. That would be like a car having a public recall for bad brakes, you would be an idiot to continue driving it, knowing the risks. If I had a Note 7, I would stop using it and revert to my old handset. And to my knowledge there has only been 3 (maybe 4) publicly announced fires (you know where the user took to Facebook/Reddit/whatever to vent). Wow, self-superiority knows no bounds. Always blame the victim. Such an evil world. Wasnt evdn a note 7.